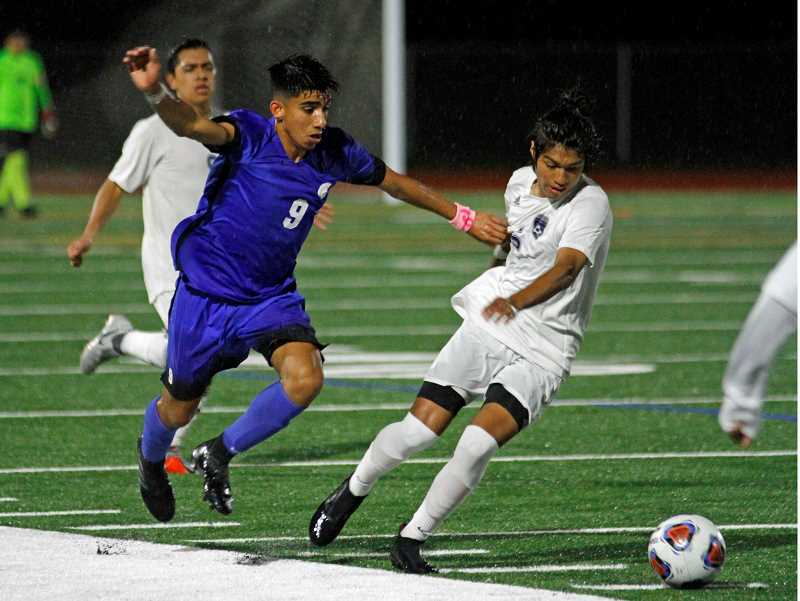 The Hillsboro boys soccer team had won four of its last five, nd was one win away from hosting a first round play-off game. But like the famous saying adapted from a line in "To a Mouse," by Robert Burns; "The best-laid plans of mice and men often go awry." The Spartans allowed two first-half goals and failed to mount a serious second half charge en route to a 2-0 loss to the Wildcats in a driving rain storm Thursday, Oct. 25, at Hillsboro High School. "We played well, we're pleased," Wilsonville head coach Ian Reschke said. "We've had some results this year that didn't go our way, and we were able to get a couple early goals and that definitely helped. Hillsboro is a good opponent and we had to win or tie to get in the playoffs so that was extra motivation for us." The Wildcats pressured from the start, dominating the ball and keeping it in the Hilhi end for the bulk of the first half. They missed on a few different opportunities in the first 25 minutes, but connected in the 36th minute when Ruben Lopez Camacho cracked a liner from roughly 30 yards over the Spartan keeper's head and into the upper left portion of the net for the game's first goal. They wasted little time getting their second goal, scoring again a minute later when forward Damien Foster beat Hillsboro goalie Pablo Mendoza Osornia to a loose ball and blasted it past the diving keeper into the right portion of the net, making it 2-0 and changing the outlook for a Spartans team struggling for answers. Reschke agreed with Hoiem's assessment and spoke to the changing mindset in the wake of the 2-0 lead. Reschke couldn't help but agree with Hoiem's assessment. But he also said the team did so not so much out of habit, but more so out of the desperation stemming from their need for a positive result. The Wildcats needed a win or tie to qualify for the postseason, and played like it.